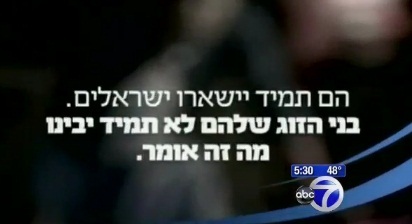 New York - There is outrage over commercials telling Israelis in this country not to marry Americans. Ads paid for by the Israeli government have outraged some people in the United States and prompted one to demand that the Israeli consulate get involved. One of the ads shows an American boyfriend finding his Israeli girlfriend staring somberly at her computer. She is, in fact, according to the internet site she’s looking at, privately commemorating Israel’s Memorial Day. “I find the ads a little disturbing, insulting, and I think it’s going to bother a lot of people,” Assemblyman Dov Hikind said. New York Democratic Assemblyman Dov Hikind represents a sizable Jewish constituency in Brooklyn. “They want to attract people coming back to Israel, that’s fabulous, but don’t insult American Jews, don’t insult our community,” Hikind said. Watching the ad, some viewers found the message exclusionary and negative. Others felt more tolerant of the campaign. Another man said that he understands the disappointment registering on the faces of these Israeli grandparents as their granddaughter gushes over Christmas. It looks like the secular Israeli grandparents have the same fears as the Jewish American grandparents. Its about their grandchildren marrying Jews. It seems the ads are targeting secular Israelis, warning them of the dangers of intermarriage and assimilation. That being the case, Dov Hikind shouldn't feign offense. After all as a religious Jew should also discourage assimilation and intermarriage. Or would he rather Israelis celebrate christmas? Both sets of grandparents agree they want the kids and grandchildren near them but them are thousands of miles apart. Instead of the Israeli Government encouraging these ads, why aren't there similar adds in EY, which would discourage Israeli girls from marrying Arabs? There are thousands of such liaisons, and unfortunately, the Israeli girls find themselves trapped in abusive relationships, and become virtual prisoners, and pariahs. There is a special group in EY, which has been formed to rescue such women. When I asked an Israeli Rabbi (who heads such a group), why these liaisons continue, he stated that in many cases, the girls don't know that the Hebrew speaking men are Arabs. I suppose if there were an advertisement stating that Americans shouldn't marry Jewish people, that would be a problem... but I don't get the impression that this is some kind of "reverse racism" situation going on here! I get the impression, that this is a sincere & solemn response to all of the missionary tactics going on out there, to all of the intermarriage happening in the secular Jewish communities & to children & grandchildren celebrating the nonsense of "x-mas", a (let's be honest) complete pagan off-shoot & a religion which basically has been overtaken by consumerism & left G-d out of the picture a long time ago! Yes... I *would* be horrified if my grandkids told me that was happening & I'm a gentile for pete's sakes! Let people be offended! I get a little "offended" by the constant barrage of x-mas nonsense in EVERY store & in ALL aspects of life! The Israelis are simply trying to get their millions of exiles to return home. I don't understand why anyone has a problem with this attempt at repatreation. Maybe I can make an add telling Americans not to give money to Israel. Maybe I can have it with the Jewish American who has to go to synagogue in America with the Israeli who is new in town and hates America and wont talk about sports and wont talk about the news on the television and then maybe I can show that the Israelis are only interested in their own culture. Then I'll show how the Israeli will only talk about Israel and how he basically hates America. Good idea huh? Don't marry us either. its not about intermarriage, its about bodies to fill their army uniforms and they use the intermarriage and assimilation merely as a tactic to spread the propaganda. theyre not concerned about intermarriage. more people are leaving israel than moving there and JNF and the tzionim are worried. Great campaign. it is not about Americans or American Jews. It is about millenia of tradition being thrown by the wayside while embracing a secullar lifestyle. Of course secullar Jews will be insulted. The ad does not validate their choices. The ad simply talks to the continuity of our people. Shame on DH for his criticism. He should applaud it. There is nothing wrong with a little honest, in your face Judaism sometimes. The fact is all practicing people believe their way is best. For otherwise, they would not feel compelled to practice. How about you right wingers marrying your own kind too. It's important to know the difference between Israeli & Jewish; between American & non-Jewish. The little girl in the video doesn't *need* to make Aliya, she needs kiruv - here, there, anywhere. unfortunately, the ad is correct. I have seen too many Israelis (even those who marry other Israelis living in USA) and they send their kids to public school. The kids become goyim just like all immigrant children. This is comical at the least. You mean to tell me these two generational Israelis, some how feel they are better for living on Israeli land? I have donated money before, whether or not it finally reached Israel for the children's education is another story. Blame the individual not the entire region!!! If Netanyahu really cares he would provide more jobs for the Israeli people so they wouldn't have to leave Israel out of necessity. Israel is the leading in the Air Force industry , on Environmental Studies on water, and on Technology, yet there are too many unemployed. How can you get exiles to come home, when you have so many non exiles enjoy the space? There are ads discouraging Israeli girls from marrying Arabs. There is an organization that helps to rescue them as well. This is a great ad that's purpose is to discourage Israeli Jews from intermarrying. What's wrong with that? Although the motives of these ads are up for debate, we as Orthodox Jews should applaud the Israeli Government for them. To Dov Hikind: I really admire your work for the community and your'e doing a phenomenal job, but I think you got this issue wrong. These ads are geared towards secular Jews to encourage them to marry within the faith. It has nothing to do with (most of) the Jews you present who usually aren't prone to the threat of intermarriage. Go #7! What's with the apolegetics from Hikind? The secular Israeli government is, for once, allowing its 'pintele yid' to emerge; albeit from a somewhat warped perspective. "I suppose if there were an advertisement stating that Americans shouldn't marry Jewish people, that would be a problem... but I don't get the impression that this is some kind of "reverse racism" situation going on here! " There is nothing wrong with a Jew marrying a member of a different race, as long as both are Jewish, i.e. a convert. We may marry Aborigines or Eskimos if they are currently an authentic member of our faith/religion. The problem seems to be that the Israeli government isn't concerned about the "Religious" intermarriage. Just the decrease (or too slow increase) of the state's Jewish population. The Ads are dead on... Kol Hakavod.. There is nothing wrong with Jewish interracial marriage, as long as husband and wife are both Jews. The problem is "interfaith" marriage. This Israeli ad doesn't really give a hoot about the religious aspect of the problem. Thank Heaven that Channukah has not yet become "commercialized" like it's (unholy) counterpart. It's still all about the Latkes... lol. It's our children's bodies that fill those uniforms, and protect your right to "Learn" all day..!!! B"H for the IDF !!! To #14-Lazerx- There are many Jews in the past who have sent their kids to public school, for various reasons. However, there is no correlation between kids attending public schools, and kids becoming goyim. I know of a number of cases where kids have gone to public school, but later became very observant. Also, there are cases of kids who have gone to day school, and later became completely irreligious! Hence, it works both ways. There are parents who cannot afford the high cost of day school, and did not want to ask for scholarships, or did not qualify for scholarships for their kids. Also, there are parents who live out of town hundreds of miles away from a day school. They should not have to send a young child to a new community all by themselves! It's a lost cause. Someone who is committed to Torah feels a reason to marry a yid. Someone not committed to Torah doesnt feel that as much. Relying on people's desire to "feel Israeli" or "ensure Jewish continuity" just doesn't cut it. “ It seems the ads are targeting secular Israelis, warning them of the dangers of intermarriage and assimilation. You are wrong if the Ads mean intermarriage then let them say so clearly. Dov is 100% right.